The Dutch company Philips has been for some time gaining some prestige in the peculiar small portable projector market. With its range of Philips PicoPix PPX2480 projector brings design and solutions especially interesting and sometimes surprising quality for the size of these devices. Below, I have mentioned the review of Philips PicoPix PPX2480 projector which could be the buying guide for this mini portable projector. As with the range Philips PicoPix generally the first thing that stands out is an elegant design with rounded shapes and where nothing stands out too. All in a device that while not the smallest of the category itself is compact enough to take anywhere, for example, your laptop bag. The connectivity of Philips PicoPix PPX2480 projector is pretty good. You can connect a USB (USB provides power, works with few speakers, but does not read external hard drives) and SD memory cards for direct playback without external devices. 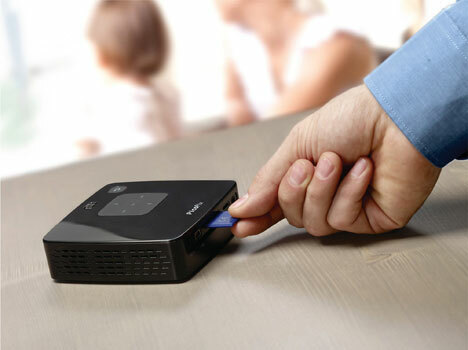 Connectivity is complete with a mini HDMI slot which can connect a cable VGA, composite video (both included) or component video and iPhone / iPhone (cables not included). In the box of Philips PicoPix PPX2480 projector, you will find a very useful and tiny remote control and an elegant carrying case (which however does not allow host connection cables). The projector has at the bottom of a hole tripod supports. On the right side the power button can be found, something difficult to use in the dark, while the top is the select button and return in addition to the focus knob. Since then we recommend using the remote control, although in the case of the approach there is no choice but to approach the projector. During installation you may find the same problems as with all portable projectors. Cables and adapters protruding from the back of the projector always unbalanced with its light weight can do little to maintain stability. Actually everyone is waiting for a design solution for this problem. 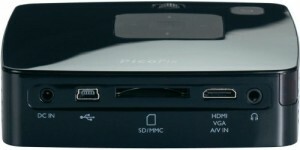 The configuration of Philips PicoPix PPX2480 projector and usage menus is very intuitive and easy to use and allow direct playback without computer or external player all kinds of video files, music and image. 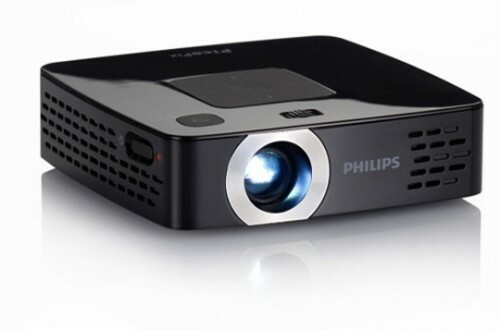 Not compatible, unlike other projectors, the ability to view files in Office, but in reality Philips PicoPix PPX2480 projector is an entertainment-oriented projector at work . The use of Philips PicoPix PPX2480 projector is a really effective. The 80 lumens (maybe even more) power of this small device can make projections enjoy equivalent to a 120-inch screen in a room with low light. The saturation and contrast of the colors are very good, especially for being a projector so small. Although not connected to power current is 55 lumens is still above other models. When enjoying a makeshift home theater projector is totally self-sufficient . Not only for the ability to play directly from USB memory, SD card or internal memory, but because the built-in speaker is powerful enough to not have to add to installing portable speakers. This is due to the layout, you have managed to book more space to the speaker than with other micro projectors. That is, the pocket home theater in seconds. If you have to put some point but only noise perhaps slightly too high, the fan and the non-presence of the correct geometry of the screen, which would be the diagonal projection. Otherwise Philips PicoPix PPX2480 is a great projector that meets smoothly and independently of its work and top it offers a really nice design.